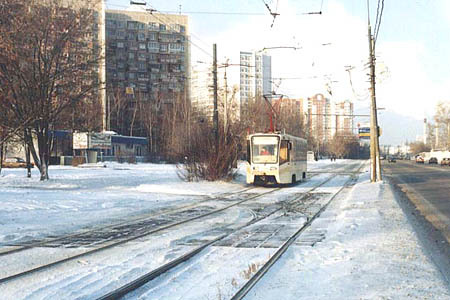 The tram line along Yeniseyskaya street in the North of Moscow is a part of the line from Rostokino to Medvedkovo. 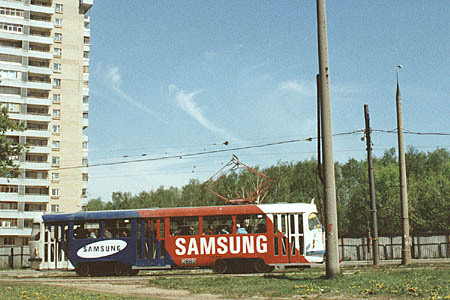 The construction was begun in Spring of 1965, and the first stage of the line was open on November 6, 1965. The line in whole was opened in September 1966. 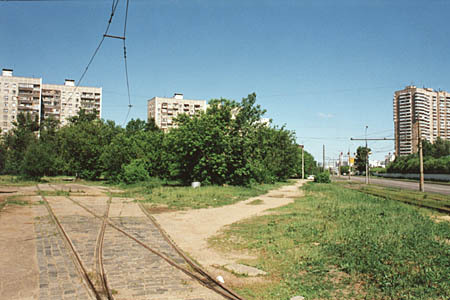 This tram line crossed the previously electrified railway Losino'ostrovskaya-Beskudnikovo near station Dzerzhinskaya, so the railway tracks were cut off and the railway shortened to Beskudnikovo-Dzerzhinskaya. The railway survived until 1987 when it was permanently closed. 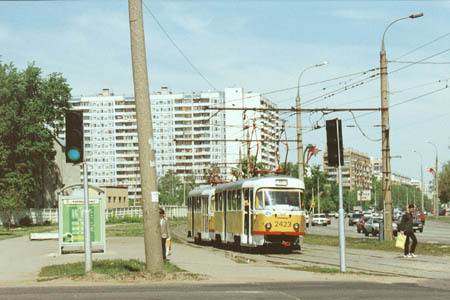 This tram line was a primary way of transportation for people in Medvedkovo, Sviblovo and Babushkin districts until the Metro came here in 1977, and even until now it remains a very significant line with high patronage. 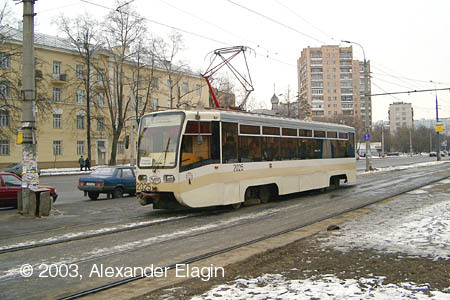 Urzhumskiy tram terminus was the final destination for this line from 1965 to 1966. Today this terminus is used rarely - mostly as a spare one, the main line is along the street in the right part of the picture. There are buildings of Sviblovo district in the background. Here you can see a turnout that branches to the reversing loop and one of the first KTM-19's on this line. Today only trams of this model make up the fleet operating on this route #17. This is the very place where the tracks of Losino'ostrovskaya - Beskudnikovo railway had been. This pole long ago supported the overhead wires of railway, and it is rather difficult to recognize it in the street. Two months after I had made this shot the pole disappeared at last, but more such poles can still be found along the former railway trail even today. More information (in Russian) about this railway you can find here, complete with lots of photos and maps. New blocks have been built in place of old industrial district. 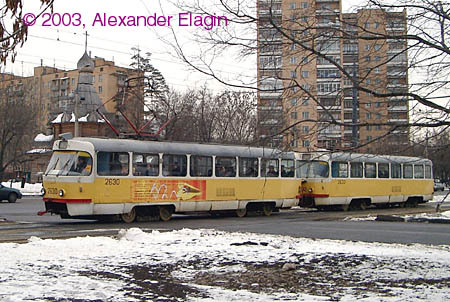 This set of two Tatras is making for Rostokino from Medvedkovo. Yeniseyskaya Street crosses a large boulevard on its way north, seen behind this set of two Tatras. A small wooden chapel in traditional style of North Russia was constructed here a decade ago. A few buildings in this street still remember the time when this area was Babushkin town in suburbs of Moscow - look at this four-storey house. 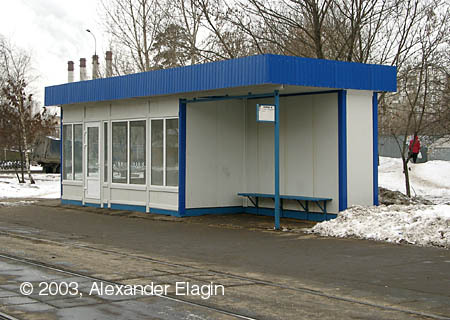 And some are very young, like this new shelter combined with a small shop (not opened yet) at Pechorskaya Ulitsa stop.